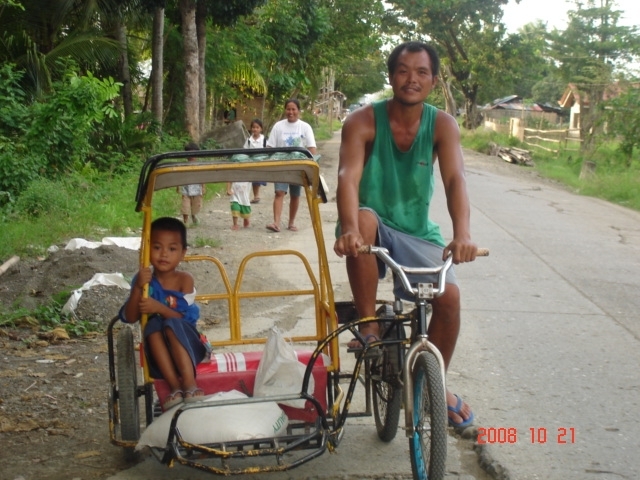 I am Dutchman and have lived in Cagayan de Oro city in the Philippines since April 2005. I was married to a Filipina, and have 2 kids, Rain and Thunder. Cagayan de Oro is in Mindanao. I am retired. When I was in the Netherlands I was already interested in Solar cooking. When I came here I was very busy with my family. When we moved over to another house and I saw many families cooking on wood fire I start to search for solar cooking and water pasteurization and I found solar cooking org. I do now a lot of research in solar cooking org to find answers and solutions about a lot of questions. Now we are busy to organize an information day about sun-cookers and water pasteurization. We, means some people of my church. We try to have this information at the end of the March, 2007. I have now my first funnel cooker and I pasteurize water in PET bottles. We are with 3 people and we hope that we also can have an information-day in my neighborhood. In the forum I hope to find people who can help us in any way if we need. I also hope that I can interest many people to use the heat of the sun for their cooking. The people here are very skeptical about what I tell them about using the heat of the sun. Who can tell me how to set up an information day for those people. What kind of cookers are the best for starters. The people here do not have money to buy any thing. You see, all help is welcome at the moment. I dug a round hole in the ground about 30 inches diameter and about 1 foot deep. I made the sides about 60°. I covered the sides and bottom with old newspapers. Then I covered the newspapers with some old foil from a junkshop. I placed a black-painted cooking pot with rice inside and covered all with a piece of glass. It took about 2 hours to cook the rice. At last there is again any progress after a while. A few people using now Solarcookers and are busy to promote. But it is very difficult to let people change. There is so many wood and cheap. Even the argument, think about the future, the envirement dnt let them change very quick. My friend of Pagadian about 8 hours traveling from here by bus brought some solarcookers and go to demonstrate in their school. Its a college with about 3,000 students. Keep some update here later. For no sunny days my friend and me make a special rocketstove with use 1/3 of the firewood as usual. Later I will post some pictures. Paul van den Hurk, Cagayan de Oro City, Philippines. Long time not adding any activity, but still there was last year some activity. We had some demostrations about solarcooking, solaroven and how to make hot water in black jars and keep it warm for longer time. December 18, 2011 the typhoon Sedong came over Cagayan de Oro and other parts in this region and when I wake up the water was already in my bedroom. My children en others in my house went to neighborhood in an appartment and I stayed in my house and tried to save some of my things. Soon the water was untin one meter high and then it stopped rising higher. The water was almost gone the next morning in my house but there was mud all around us. All my demo material for solar cooking was damaged. But my kids and others in my house were safe. That was the most important. Now I wish I had a lot of solarcooker sets for to distribute to those people who lost every thing. But I only try to inform people to make simple solarcookers, but they like to continue cooking on firewood. Next month we go to start again with to give demonstrations about solarcooking and hopefully we can reach more people. we do it now via school and church. Thats the update for now. Cagayan de Oro City, Philippines. May 3, 2011. For this day I was invited by the LDS missionaries for a demo and workshop solar cooking. They would bring that to other people and also try to spread that in their hometowns when they will return home. We should start at 8am, but due the traffic it was almost 9 before we could start. There was a bright sun, but far away at the top of the mountains we could see some clouds. So I decided to set up some solar cookers and started to cook. We cooked rice, chicken legs and hotdogs. Then I started to explain about solar cooking, divided them into groups, gave materials and let them make the solar cookers. It was a lot of fun and I could answer all their questions. After one hour and a half the sun started to hide every time after the clouds and I knew the rice was not yet cooked. We continued the workshop and 30 minutes later it started to rain. We brought all the things from outside inside the building. Everybody was curious about the cooked food. I let them open first the hotdogs. Well cooked. Then we opened the chicken. Well cooked. At last the rice. Almost cooked. I told them if we had started in time all was cooked. While we finished the rice on the electric stove, I told about the benefits of the hay box. After 10 minutes the rice was cooked and we could start to eat what was cooked by the heat of the sun. Everyone was as always very positive about solar cooking and promised me not only to spread the gospel, but also the solar cooker. The rain season has stopped and it is again time to do my demos and workshops. Next demo/workshop May 13, 2011 is for the young men of the LDS church in Gingoog City as a part of a celebration activity. Demo and workshop in Gingoog City, Philippines. We would have a demonstration and workshop solar cooking for the young men from the Church of Jesus Christ of Latter day Saints in Gingoog city. The city is located between Cagayan de Oro City and Butuan in Northern Mindanao, Philippines. My friend was so nice to offer us his car, so we could bring all the materials easier as to bring it in the bus. We left early in the morning to be sure to be in time there to set up the solar cookers. I had with me 4 box cookers and 2 cookit, cooking pots, other materials for the demonstrations. When we arrived in Gingoog we started with to set up the solar cookers I brought with me and filled the cooking pots with rice and meet. We filled 2 big plastic bags with hotdogs for 2 others solar cookers and we filled 2 black socks with bananas, put those socks in a plastic bags and in the last 2 solar cookers. Then we started the workshop and after we told the history of solar cooking we started to make solar cookers. During the workshop a strong wind has blow down some solar cookers including a cooking pot with rice in it. We did not mention the water was gone and we put the cooking pot back I the solar cooker. Then we continued the workshop. After the workshop has ended, we had 4 new solar cookers. It was time to go for the food because everybody was hungry. But we had not so much food for all the people around us. First we opened the bags with the hotdogs and cut each in 5 pieces. Very tasty, well cooked, wow it works, I can’t believe it. That is what we hear every time if we have a demo. Then the cooked banana’s and the same remarks. As last we opened the rice and the pot that was blow by the wind was not cooked, because no water. The other was ok and the people wanted to have a solar cooker. But they will have again another workshop. We go schedule that and it will be the next month. After the review about all and answering some questions we went home, back to Cagayan de Oro City. I think again we have some people going to use the solar cooker and spread it to others. Next demo/workshop may 28. We start then to make a training team for solar cooking in our church and go spread that later to more members and their neighborhoods. My son Thunder, a good help sometimes. Raining again. No weather to use the solarcooker. Sometimes just a few hours and then the sun is again behind the clouds. The only I could do for myself was to dry Moringa leaves and grind it to powder for to make Moringa capsules. We sell the capsules to sari-sari stores and others who are interested. This coming month we are invited by members of "the Chrurch of Jesus Christ of Latter Day Saints" in Iligan to give a demonstration and to have a workshop. It is about 2 hours driving from here and I have to rent a car for that. Even if there is no sun we can still give the workshop. Others have also reqested demo's and workshops. Maybe the name of my kids Rain and Thunder are a reason for the bad weather, but I know it is the global warming. In the Philippines people are asked to plant more trees. Thats it for now. Keep going you all. Hi, from the Philippines. Even there is no information about progress here, I still doing some activities about solar cooking. Preparing and planning for the sunny days are coming next months. Now we have very bad weather with rain and wind. For me, as Dutch, is the weather ok. It remaind me about Netherlands in the spring and fall. I hope I can use this year again a little money from my retirement pension again to continue demonstrations and workshops. Anyway, most of the people here are poor and it is better to give them information based on their budget. Thanks for reading and a late Happy New Year. Not too much activities at the moment due lack of sun. Only personal information to people in this area. Schools, Churches and neighborhoods. We have some demo's planned as soon the weather will change. Time to check my materials we always need and to make some flyers and other information. Here are real, real poor people. We really need to use simple materials, because the people don't even have money for to buy some all. foil and my income is just a pension, what means I can not always buy all the materials we need. But we often find a solution. We have an invitation from another Island Leyte. It is about 8 hours or more by bus. I am not sure if we can make that, because we have to bring so many materials and it would be better if we had a car, but to rent a car is 3,000 peso (65 Usd) a day. Ok, we will see how it goes and I keep you informed. Workshop June 19, 2010. Cagayan de Oro City, Philippines. We will give thank to the MAKRO who sponsored us with many empty carton boxes. The workshop started around 10 am. After explanation about some technical details some people started to make their own Solar Cooker. Just look at the pictures to see the progress. Around lunchtime we stopped and there were 5 solar cookers finished. Next week I go follow up about the use and distribute some plastic bags. It is very difficult here to find big plastic bags for to put the cooking pot in. Often we make from 2 small bags one big one. We have now more invitations for demo’s and workshops. So better we do workshop and demo at the same day. It save time and traveling expenses for us. Conclusion: some details and techniques we have to explain better next workshop. Materials are another detail we have to think about. Special the foil and glue. We had fun and add more friends to our life. Back again. Those 2days we used to demonstrate solar cooking in the school of my children. It was just an impulse. Talking about solar cooking at home we want to let more people know about it. Then we decided to set up 2 cookits at June 16 and cook hotdogs for all the nannies (yaya here) and other people who were around. As usual the idea was ok, but nobody was interested to sponsor some hotdogs. So I sponsored, as always, this time one kilo of hotdogs. Many of them were very skeptical and didn’t believe the sun could cook that. I put the hotdogs and 2 clear plastic bags and then in the cookit. The time was 10am. Maybe questions were answered by Nemisia and some people wanted to have a demonstration for family, or organizations. At 11 am we opened the bags and presented the hotdogs to the people there in the waiting area. Tasty, great, unbelievable is what we hear always and also this time. We promised to go back with another model solar cooker the next day. The next day June 17, 2010 seemed not so sunny as the previous day. But at 6PM we started to prepare all the things for our next demonstration. The solar cookers, cooking pots with rice and meat (pork ribs) and all the other materials we needed. After the children finished their preparation we went to school riding a trisikad (open link to see one). (http://mffpangpang.files.wordpress.com/2008/10/3sikad2.jpg) This time we needed 2 because we had to bring a lot. But normally we ride only one. When we arrived at school we set up the two solar cookers and put in the rice and the meat after people inspected that it was not yet cooked. And then at 11.40AM we opened the plastic bags and got the cooking pots out. Under the critical eyes from many we opened the pots and….. He rice was not cooked enough by lack of water, but the meat was real tender. We let the people try again and there were many discussions about the solar cookers. We got some more invitations for workshop, demo and information. The security guard asked the left over and he has his meal for that day. All together we had two great day at the Kong Hua school in Cagayan de Oro city, Philippines. Some pictures are attached. Tomorrow a workshop in another area, but the solar cooking goes forward and hopefully I can soon post and write about the progress here. The day after the elections in my homeland Netherlands. Many things are going to change the coming years I guess. I am wondering what parties are going to make the government and who will be the Prime Minister. I go sleep now and at the moment I am Father, Mother, have to bring and to pick-up my 2 children at school and do some in the house and in the freetime I do some about solar cooking. Will you see me? Look at www.hyves.nl and them PGM you can subscribe there also in english and leave a message. A lot of questions today during another demonstration in Cagayan de Oro City. Last week while I was walking in another part of our city I passed a place with simple houses and many people living in those houses. I started to talk about their living and special about their way of cooking. As usual most of them are using "kahoy". Look [here]http://www.thenewstoday.info/2008/06/06/ for a picture of kahoy. I explain then about solar cooking and told them I would be back at June 3 for a demonstration about solar cooking. June 3 was a very cloudy day so I went to the villagers and told them to wait until the next day or next week. But today it was perfect weather for our project. I talk every time about we and I will introduce my friend and translator, Nemisia Bontilao from Aurora in the Philippines. She translated the trainings manual from English into Visayas. She is a great help and knows more and more about solar cooking. We started today around 9 am with a real clear sky. After we arrived I prepared all the things we needed and Nemisia was the one who explained all I did. We cooked chicken adobo and rice. Unbelief, skeptical and wondering with what we are going to do. We put the rice in a cooking pot and the chicken in another and then in the solar cooker. Then it was time to transfer our self in the shadow and to start to answer the many questions. With so many questions the time flies away and before we know it was time to let the people see the results. All was cooked very well and in no time all what we cooked was eaten by the villagers. Tasty, tender, great invention etc. etc. was what we heard. The next step is to have a workshop for those people and it will be held June 19, 2010. For that workshop I have to find some sponsors who will offer us some materials and then special all. foil All in all we had a great demonstration and we all looking forward to the next solar cooking activity. Nice to know that in the North of the Philippines another project has started. Read the following mail I received. Here a picture from solarcookers in my own garden in the Philippines. And today I had my first order to deliver a solarcooker from one of my neighbors. Sweet corn, sweet potatoes, eggs, all without water. Puso (rice in a small basket of coconutleafs, open the link for more information.. [] ), pork, beef, chicken and fish. That all was cooked last week in my neigberhood demonstrations. The weather was perfect. Not even one cloud during the cooking time. I put the food for the lunch in the solarcooker before 9am and it was finished. The food for dinner at noon in the solar cooker and it was finished in time. Meat very, very tender and the other foods perfect. I cooked just beside the road and many passing people asked me a lot of questions and I have now some invitations for demonstrations. I talked about the puso in the Cogon Public Market and people couldn't believe it was only the sun, because the rice in the puso has to be boiled for about 40 minutes and in the solar cooker it take longer but no any fuel. It was a nice discussion and we laughted a lot. But the result is that I have to demonstrate for those people next month. It is a very crowded market and I am sure it will be a succes if we have the sun as the last week. I have to contact now people who can give me permission for that demonstration. I will update this site after each activity. I have problems with to make a cookit, because I can not find the rigth material. I use now illustration board and tape 2 pieces together so I have the size for to make a cookit, but it is not strong enough. Some one a good idea or tip? I tried to make a solar oven with a black painted and isolated carton box. After I put in the rice in there and has covered with a glaswindow i put some extra reflectors. After one hour my glaswindow broke in many pieces. Can some one tell me what to do so the glas will not break. Neighborhood demonstration. Today I was asked for a solar cooking demonstration in my neighborhood and also the coming weeks I have been asked for some demonstrations near my house. Today I cooked rice, pork and eggs. It was like in Davao cloudy and windy. Learned from Davao I let the food this time longer in the solar cooker. After the cooking time the rice and the meet were cooked very well and the eggs were soft boiled. It was a nice demonstration and the people were also convinced about the benefits of solar cooking. I am sure that some people of the today’s demonstration go to build a solar cooker within 2 weeks. I hope the weather will be a little better the coming days. And next week I will make another rapport for this site. Solar cooking demonstration at the foot of the Mount Apo near Davao in the Philippines. April 5, 2010 we left, around 10 am, Cagayan de Oro city for the trip to Davao. I have got an invitation from the AbointizPower company (www.abointiz.com) to have a solar cooking demonstration April 6 2010. When we arrived in Davao we went to our hotel and reviewed the demonstration for the following day. At 5.15 am the alarm of my cell phone waked me up and told us to prepare for the demonstration. After shower and breakfast our 4wheel driven car, with driver, my contact person of the company and a photographer, arrived to pick us up and to bring us in the mountains to the barangay Tudaya. The road was very rough and I guess our driver was a rally driver. Nothing was too difficult for him. Deep holes, big stones, steep slope up or down but I really enjoyed the 2 hours trip to the barangay. Very beautiful overviews in the mountains. Many trees, with different kinds of fruit, crops in the fields, rice fields and many other vegetables and fruits. And most of all, children, children and more children. In Netherlands you can see any color hair, but here you see only brown and black hair and eyes. And at this moment so many banners, folder and pictures for the coming elections in May. It really take your view away from the beauty of the nature. I am wondering if after the elections all the candidates go back to remove all those banners, folder and pictures. But whenever we arrived in the barangay and after a short hello we started to set up the solar cookers first, because there are many clouds and we needed the all the moments with sun. After the solar cookers were set up and filled with the different kinds of food I started to explain about solar cooking. After a few minutes the representative of the company asked me if I could speak in Bisaya, the spoken language here. I can’t speak Bisaya and my friend took over to explain the things I did. We cooked rice, sweet potatoes and chicken adobo. The weather was not real as what we expected, but there was sometimes sun. While the food was in the solar cookers we talked to the people about solar cooking, water pasteurization, their life in the mountains and other things. The wind was so heavy sometimes that one of the solar cookers was blow down with the cooking pot with the chicken in it. Around 1 pm we stopped cooking and opened the cooking pans. The rice was almost cooked, the sweet potatoes also, but the chicken was ok. It convinced the people that solar cooking is possible and that they can save, wood and fuel for cooking. We were invited to have a workshop in the month of May after the elections. After we packed our demo materials we left the people and drove back to the city and the bus terminal. We left Davao around 5 pm and arrived in Cagayan de Oro around midnight. Conclusion: Even with a little sun we could convinced people the benefits of solar cooking. We got an invitation for a work shop about solar cookers and the company will contact us for that. Another demonstration day. This time for the church members at the last day from the family week celebration . We used 5 solar cookers to demonstrate and we cooked rice, sweet corn, hotdog, banana and one solar cooker we used for to pasteurize water. This time the sun didn't hide and all the food was cooked. The number one for the youth and this time was the same is always the hotdog. This time we gave a flyer, "how to make your own solar cooker", to all of those who were interested and the numbers of interested people is growing. During the demonstration we got another 2 invitations for demonstration and workshop. At last, after all, we are on our way to spread the idea and use about solar cooking and with the 4 next demonstrations it will go better. Thank you for reading. Will be continued. Today we were invited for solar cooking demonstration and information in an elementary school here in Cagayan de Oro city. A lot of parents want to have more information and in 3 weeks there will be held a workshop for the scouting group of the school. There are about 100 scouts and the plan is that every scout make at last one solar cooker (model heaven's flame, but without the box)They have 3 weeks to collect the carton and I try to find a sponsor who will donate the aluminum foil because many parents can not pay, even that. Another principal will have a workshop for the teachers only and later for grade 7 and 8. One problem is still the time between cooking and eating for many people. I explain that the cooking time is longer, but they do not real understand. I go to make a flayer in were I explain the benefits of Solar cooking. Hopefully I can change some of them and then hopefully after 1 or 2 years the rest will follow. No posting will not mean there is no progression about solar cooking here in this area. At the moment is it not real good solar cooking weather. Only in the morning there is sun sometimes and in the afternoon we always have rain. I told people who use a solar cooker to cook the the food all in the morning if possible and then to store it in a haybox. For me it works and I am sure it will work for others too. Yesterday i cooked 4 sweet corn in 3 hours without water. I wrapped them in a black T-shirt and put all in a plastic bag and in the solar cooker. It is more tastier. Rice meat and vegetables taste much better. This month we have an information and demonstration day for about 100 women. We hope the weather is good that day. More about that day later this month. Open House.....Kauswagan Mormon Church Saturday June 7 2008. We had an Open House to let people see our renovated Chapel. The renovation took 7 months, but we have back now a very nice church. During the Open House we had a demonstration and information about Solar Cooking. My Solar Cooking team had set up 5 Solar Cookers ( 1 Cookit, 2 Parvati and a kind of Heaven's Flame) and 1 stove based on the "Shielded Fire Stove" The set up time was 11 AM and the open house started at 3 PM. It was not a good solar cooking day, with clouds and wind. In the Cookit we cooked hotdogs but we did that around 3PM 2 small hotdogs on a stick and all together in a cellophane bag. In the other cookers we cooked rice and Humba (meat with spices). We used black cooking pots in a cellophane. We did not use the stove, but there was information about it. And one of the team members who is using daily the stove explained the working. The reflectors alone from the Heaven's Flame design can be used to cook. To be sure the food was cooked even with not so much sun we opened the cooking pots at 4PM to let the visitors see and taste the food. The hotdogs cooked in the cellophane was for the younger children and was eaten in no time. The rice was cooked and the meat was tender. Amazing, unbelievable, I can't believe it,tender and tasty were often spoken words when people saw and taste the results from our Solar Cooking demonstration. Many visitors want to know more and asked for demonstration in their neighborhood and even in their own garden. We are very happy to know that so many people saw the results about Solar Cooking. I see already in my neighborhood some solar cookers in use and we have the coming weeks demonstrations in other neighborhoods. I ask now the people to bring the food, because in the open house I paid all the expenses by myself. I am sure in this neighborhood Solar Cooking will be spread and then will spread slowly through this city and country. But it has started and it will not stop anymore. The team member who uses the stove has already some orders to make one. He has no job and now he make 1 stove a day for sale. I buy cement and the other materials for him to start his business. I am very happy for him and his family. My conclusion: The open House was successful and positive. Solar Cooking has started and more will follow. I have experience that the Cookit cannot be used successfully in the Philippines. (Does anyone know why?) The Parvati is better, but difficult to make. The best, in my own experience, is the Heaven's Flame cooker, but only with 4 reflectors and without the oven. The temperature goes very fast up and is easier to make. Pictures later. Fifteen solarcookers and 3 stoves are in use here now in this neighborhood. all the solar cookers are Parvati Solar Cookers. More people getting interested and coming Saturday June 7 2008 we have an open house in our church (The Church Of Jesus Christ Of Latter Day Saints} and an information and demonstration Solar Cooking. We make a transportable stove from cement and we will present that too during the Open Day. It save 60% of firewood, do not produce smoke once it is burning and reduce the cooking time wit 50% as the tester told me. He has not to buy firewood anymore. He just go to the trees and pick up some sticks from the ground and he use that. My friend and I are planning now to go to schools and try to have workshops about Solar cookers. We will ask if during those workshops students will make Solar Cookers for the poor people in their neighborhood. One school already has picked up the idea and they will make Solar Cookers, but for their own students, because the are all from poor families. I also make from the Heaven's Flame Cooker, only the 4 reflectors. I glued the 4 reflectors together and make just a bottom, not a box. I test it now and it work the same as the Parvati Cooker and it is much easier to make. I make each reflector with a base of 32 cm and with the top of 74 cm and the angle is 67 degrees. I glued silver sheet paper inside. The temperature goes in 2 hours up to 250 Fahrenheit. Can some one tell me what is the different between the round and the square Solar Cooker? Next week I will continue en post some of the open day, and I will post some pictures about it. What a great feeling to see my friends using the different of Solar cookers with good results. My friends are living in very poor neighborhoods. Most of the people around them getting more and more interested about Solar Cooking. Next month, after my friends have more knowledge, we will have some demonstration days and workshops. One of the introduction days will be held at the church area the first week of June. That day there will be an open house at the renovated church. Our team will be there with their solar cookers and we will prepare snacks. We are trying to find Donors who will offer something for this open house. One of our team members has make a Shielded Fire Stove from soil and cement it work very well and it save him time and firewood. He make another one, transportable, and with the same results. as the bigger one. Another team member will start a business, produce and selling Solar cookers. This coming Saturday we have a meeting about how to start that kind of business. Any helpful tips are welcome. We try to find the big cardboard 120X90 cm for making the Cookit. I make the Cookit in 3 parts and then I taped it together. Now it is working Very Good. The problem at this moment is the daily dose sun. But it will change I am sure. All together the project is going on and I am sure at the end of the year 100 or more families will us a Solar Cooker. Please if there is something you think it can help me, please let me know. At last there is progression about spreading Solar Cooking here. I make some Parvati Solar Cookers. I buy some small cooking pots, painted them black as instructed and went to my friends with all those things. I used the trainers manual for to instruct them about Solar Cooking. I visit them almost every day and they were all amazing about it. All those people do have friends around them and I see how more and more people getting interested and want to know more. The next step is now to have some workshops. I am busy to prepare and with the testimonies from my friends I think we are on our way. Why do I use the [[Parvati Cooker[[? I make a Cookit, but it did not working very well. I don't know why not. (maybe some one can answer that question) So I make the Parvati Cooker what works very good. But it is more difficult to make one. It cost more time and is more expensive. By one of my friends we make a Shielded fire stove from cement. He is still testing it, but the results are until now very good. More people (using firewood) around him want to know more about it. I try to find some donors who will donate materials and other things I need. I know now the way is long, but looking to the results at the moment I am very optimistic. At the moment there are a few people starting to use a Solar cooker. I go visit them almost every day and talk and evaluate. I am very happy now to see people getting more and more interested. People of my "team" cooked rice, chicken adobo, banana's, eggs, sweet potato's with different results. But they all are interested to know more. So it give me a good feeling. At last we can also spread here Solar cooking step by step. After one year I am back to continue where I stopped last year. I am sure it will be a better year. More people are interested and a team has started solar cooking. Today I cooked only vegetables. A very hot day and no problem at all. As last year we have a workshop in April and I wish I could have some solar cookit as used in Somalia or Kenya. Any one an idea how to get those cookits? Please let me know. Today I put some meat outside in my solar cooker. When I 2 hours later looked in the Cooker there was no meat anymore. Looking around I found back my things, but no meat in there anymore. That dog always watch me when I go outside to put the cooker in the sun. I will find a way to be smarter than that dog. Still a lot of cloudy days at the moment. But sometimes we can use the Solar cooker. The preparation about the information day goes on schedule. We hope, that day, the sun will visit us the whole day. Already 3 days too cloudy to test my Solar Cookers. We hope for sun in the weekend so we can test again with more people involved. We hope for sun during our information day in April. Thank to all who gave me tips and answers for my information day. I did build my parabolic cooker from a carton box (for free) Alu. folie (20 Philippines peso) and some scotch tape (5 peso). All together 25 peso (US$ 0,51). My coming information day will be hold on April 5 and 6 2007. Many people here are already very interested about solar cooking. I am busy now to make the FUNNEL cooker and I will make 1 or 2 box cookers. Just to let the people see de differences between the SC. Next time I will glue the alu. folie on the carton. In the bottom from the solar cooker I put some black carton. I painted a cooking pan black en put it in the solar cooker (after it was dried). I put a glass lid on the pan. I covered the whole parabolic cooker with a plastic (for free) I am looking very forward to the information day and if some one has a good idea, just let me know.